Chiado is definitely one of the most charming areas of Lisbon. The main street is has some nice historical cafés, but they tend to be very touristic. A great alternative is Café no Chiado. 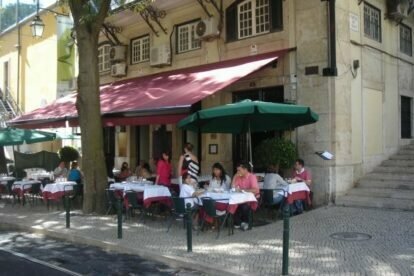 The location is excellent: smack in the middle of Chiado, with tram-line 28 passing right in front of you! The place has been renovated in 2006. It nowadays has a very cool interior and a great terrace. Come here to have a cup of coffee or lunch, read a book on the terrace or just to enjoy the setting. Try the salads, they are great!